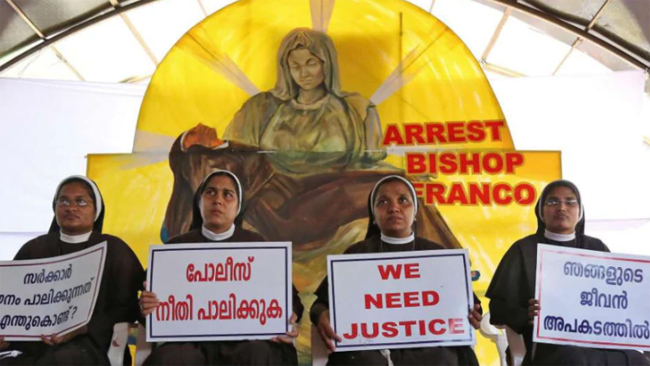 Kottayam, Feb 10: Hours after a group of nuns, who had protested seeking justice for their colleague, allegedly raped by former bishop Franco Mulakkal, said that the order asking them to move out of their convent has now been cancelled, the Jalandhar Diocese of the Roman Catholic Church on Saturday denied the charge. Peter Kavumpuram, the public relations officer of the diocese, said the order has not been cancelled, a well known media reported. He said it was up to the mother general of the Missionaries of Jesus congregation to take a final call on the order and clarified that it was not a transfer order. "The four nuns were only called back to the convents where they stayed earlier," he added.